Creating a subscription library — Spruce Rd. Last week we had the pleasure of spending our lunch with Lauren, of Elle & Co, chatting about the ins and outs of her Library subscription. A subscription library is a form of passive income, where customers pay a monthly fee to receive new downloads or resources each month. Lauren set up her subscription library about 1.5 years ago, and today it continues to be one of the most consistent sources of passive income for Elle & Co. I’ve had the pleasure of working with Lauren over the past few months, contributing workbooks + templates to her library subscribers. In this workshop Lauren transparently walked us through how to create a subscription library of your own, her advice on which platform to use, even down to how many subscribers she has monthly. Make sure to watch the entire tutorial, and don’t miss the great questions our audience asked at the end of the recording! Lauren, as most freelancers, originally struggled with the idea of inconsistent income. Rather than fighting this notion, she developed a creative idea to create some sort of consistency in her income. Through a subscription model, she has stable income from the consistent subscribers. It provides a more steady + recurring income to supplement the inconsistency that freelancing provides. 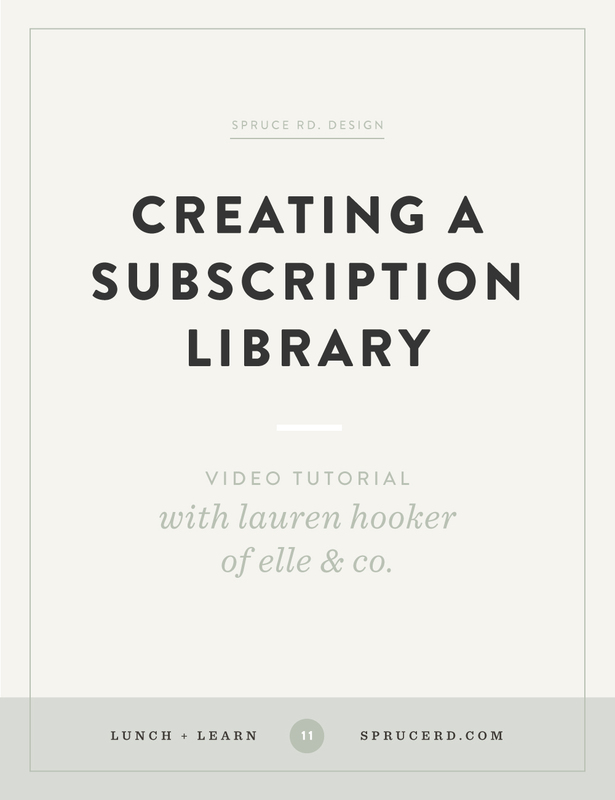 Setting up a subscription library may seem intimidating, but in the video tutorial Lauren shows how she easily set up a subscription page on her Squarespace site. She personally uses Tinypass, though gives her honest feedback and what she would have switched to if she were just starting the Library now (Memberful), considering the slow payout from Tinypass. It is important to protect your paid subscription through a membership platform. We recommend against a simple one-password protected page, and instead encourage individual memberships for the plugin. This essentially allows the subscriber to login with their unique email + login to access each month’s content. This not only protects subscribers from giving out the generic password to everyone, but it also protects you if they discontinue their subscription — yet still have access to the content. Lauren and I discuss a few easy membership plugins + platforms to help get you started. We hope this workshop was helpful for you, and can’t wait to see how you create a unique subscription library for your audience!